Thank You for this possibility to come back. I have never even suspected that coming back is so hard. I am writing the 15th version of this post now due to the words are stumbling on each others. Its are in hurry to see Your beautiful smile. I missed You very much. I missed my wings which are Your reading eyes. 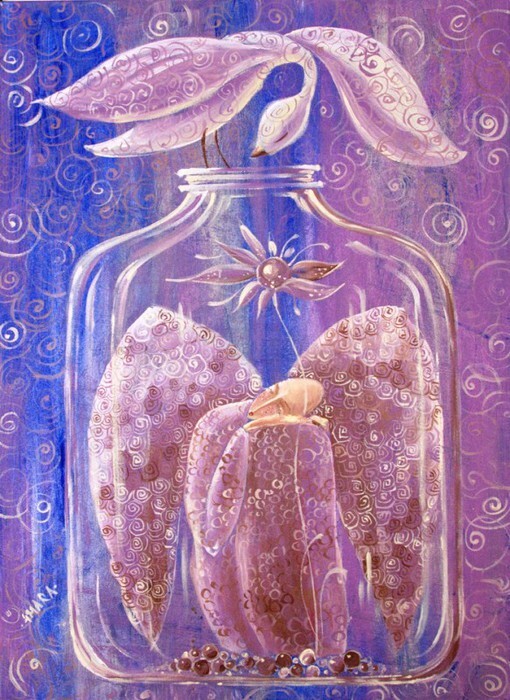 You see my angel on this amazing painting by Marina Chaikovskaya. I have found a very nice book “Silence. The Mystery of Wholeness” by Cheryl Sanders-Sardello. Look what he writes, “The enormity of life’s tasks weigh and press on the day… they demand and insist on a constancy of attention that is relentless. Ah… but we are fortunate to have night’s solace – in the silence that is created by the dark”. The Author continues, “Night… that melancholy time, when the stars remind us of the silence of God. Here we can remember the future and lean into the unknown, setting aside the oppressive weight of our carefully constructed version of who we think we are, and release that side of the pool. We can remember how to see in the dark… with our ears… perceiving the silence in its holy echoing and resonance, its calling forth a knowing that is from soul”. “This silence sends us on a different pilgrimage. It guards the heart’s fire and teaches us to speak from within, with a language that is imbued with the sacred. Words thus nurtured in this holy silence fly forth with the wings of joy, and return to lead us back to the silence from which they were born.” What a beautiful words! The sounds of Chopin’s nocturne are in my ears. Silence is a treatment for soul. And as a therapy by drugs silence demands the particular dosage. You know silence is seductive and narcotic. Overdosing is dangerous. Once I had found myself as a fly trapped in a spider’s web. I do hope I have escaped the web by the wings that follow me. You are my wings. Thank You for my awakening. What a joy to find you here! The book looks good, will have to check it out. You were never totally asleep, just listening to the sounds of a silent island where all is tender and soft. My dear Linda, your comment is beautiful. …I am a snowflake flying in the sky, your tender breathing is keeping me alive. Yes, it’s a great treat to see a post by you again Glorialana. Ditto to what Linda said, the book looks delightful and I really love the quote. Dear Debra, thank you, happy to know you like my post. Dear, beautiful Brenda, I was thinking about your fairy-tale world and missed it very much. I am happy to come back. You inspire me. Thank you! Glorialana, you have been missed.. But sometimes we each need to embrace that Silence to enable us to listen to our own inner heart beats.. I agree with Linda.. You are unique and precious, And if you were a snowflake.. Your gentle beauty floats down to land and melt on each of our hearts Glorialana.. I am sure the Book’s wisdom is well worth the read..
You know Sue, you are so generous soul! Your words are so heartwarming and uplifting. I am thinking about “Do I deserve your attention, your energy and vibrations?” – I tell you my secret: I am not wise, I am, unfortunately, lazy. I will fix it, I promise. I missed you. I missed your world. Thank you for your supporting and being in my life. I know I neglect many, and many neglect myself in the world of cyber-space of WordPress… Such is life… We each have our Day-Jobs/ Life to to live.. The most important in each of our worlds is our immediate one.. The one that revolves around family and the bond with our loved ones.. And we must never forget the most important person in all of this too.. Which is YOU!… You have to take care of your own needs ..
Love and Blessings Dear One..
My darling you have been missed! I also understand the need to embrace the silence. It is like embracing the light even when all you see is darkness around you. Taking charge of your mind and soul is a neverending task, isn’t it? It is always so easy to give in…give up. I am happy you have returned — your words are always so inspirational. So magical. Hello Claudia, my kind, light and smiling Goddess! I am so happy to see you with me again. I was thinking about you and those thoughts helped me to find your smile – my lighthouse to find a way to break down my darkish grey glass wall of silence. I feel myself as united Berlin :-)! This post is so pretty and restful. it has a really calming impact but I particularly like how you have composed it with a beautiful image, some lovely music and then your own writing. Thank you. Thank you very much. Happy you like it. I will try to bring you a pleasure of seeing nice paintings and listening good music again. It’s nearly bed time for me and what a beautiful post for me to sleep on. If only we could force some politicians into 50 days of silence………….